This may sound complex, but the effect of a collar is simple enough. Your stock market returns are limited to a range. If stock losses are too deep, the purchased put options compensate you to limit your losses. If stock market returns are very high, the call options you sell limit your gains. You may wonder why anyone would bother with the call option part if they limit your gains. The answer is that you get cash from selling the call options that you can use to buy the put options. So, in trade for the guarantee that you won’t lose too much, your gains are limited as well. The particular strike prices of the options are what determine the limits on gains and losses. Of course, we prefer a tight limit on losses and a generous limit on gains, but we’d also like the cash generated from selling the call options to cover the purchase of the put options. This forces a balance between the upper and lower limits on returns. Let’s continue with yesterday’s example of investing in large US companies through the S&P 500 (which is now sitting at 907.00 as I write this). This time we’ll focus on limiting losses between now and December 2009. If the S&P 500 were to drop to 800, this would be an 11.8% loss. If we don’t want to lose any more than this, we need to buy December 2009 put options on the S&P 500 struck at 800. The current ask price of these options is $55.60. So, we need to sell call options at the same price. Unfortunately, options don’t come in enough choices to exactly match this price. However, we can sell two types of call options to get the right blended price. The bid price on calls struck at 950 is $64.30, and for calls struck at 1000 the bid price is $44.90. With the right blend, the average price is $55.60, and the blended strike price is 972.4. Unfortunately, this blend of call options means a cap on stock returns of only 7.2%. So, the returns over this 7.5-month period are limited to between a loss of 11.8% and a gain of 7.2%. This doesn’t seem like a very good deal. In fact, assuming that the average yearly stock return is 12% and the yearly standard deviation is 20%, the expected return from our collar works out to 1.3% over those 7.5 months. That didn’t work out very well, but it was based on just one choice of option strike prices. The following chart gives a range of possible collars and the expected return from investing with that collar. To understand the chart, imagine any vertical line cutting through the chart. The blue line is the top of the collar, the red line is the bottom, and the green line is the expected return over 7.5 months. To decide if any of these collars are worthwhile, we need something to compare them to. Suppose that the alternative to a collar is just using a 70/30 asset allocation between stocks and a fixed income investment returning 2%. If we expect 12% from stocks, we expect 9% yearly from this allocation, or about 5.5% over 7.5 months. 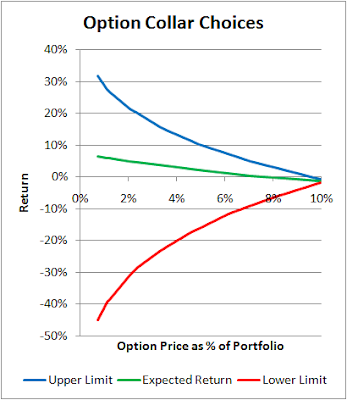 To get an expected return of 5.5%, the collar ranges from a loss of 34% to a gain of 24%. This is definitely not very useful. If an investor is looking for protection, capping losses as 34% over only 7.5 months isn’t much protection. But, limiting losses further cuts into expected gains and makes this approach less desirable than simply buying some fixed-income investments. Note that this discussion has ignored the commissions and taxes resulting from trading options. Overall, I’ve still failed to find an option-based strategy for portfolio protection that competes with asset allocation. Perhaps the problem is that recent stock market volatility has changed option prices in an unfavourable way for collars. In any case, I’m not going to be trying any option strategies for portfolio protection until the numbers make sense. The reason for 'bothering with the call' is that you concluded buying puts was too expensive (I agree). 1) Some investors care far more about preservation of capital than they do about future earnings. Collars are designed for those investors. 2)You don't have to sell a call that completely pays for the put. You can choose a higher strike price. That results in paying something for insurance. 3) If you truly anticipate a 12% return for stocks (that's bullish!) then you need far less protection that the investor (that's me) who has no idea of how much stocks will return in the future. Mark: Certainly collars are for people wanting to preserve capital, but it only makes sense to use a collar if the resulting expected return is above the risk-free rate. Otherwise, why not just stick with fixed-income investments. Paying a higher strike price for the put might make it difficult to beat the risk-free rate. I didn't bother to explain the math details fully, but the 12% figure is the arithmetic mean. With 20% volatility, the geometric mean would be about 10%, and with higher volatility, it could go down to as low as 9%. It is these lower geometric mean values that are more relevant to long-term returns. Mark i have been a huge fan of yours. forget the collar for now.. Anonymous: I don't know if Mark will reply, but I don't really like either choice. However, if you're determined to pick one, it's not too hard to decide which one. Add up the total expenses of each choice and (assuming they represent the same index), choose the one with lower fees. The segregated fund's fees will be mostly the MER. There may be trading fees as well. You'd have to look at the prospectus and annual report to see what other fees are charged. The other option (buying the index directly) will have the same type of fees (at lower levels) plus the cost of long-term put option. I hate to be so late to reply, but I do not like either choice, agreeing with Michael. Buying an index plus puts is exactly the same as buying call options. Buying calls does have the limited loss feature, but it's far (far, far) too risky for me to recommend to anyone. It does give you the chance to make a lot of money - if there is a nice rally. But, it's just as easy to lose your entire investment. As I reply, three months later, we all know that puts plus index (or long calls) would have worked. That does NOT mean it's a good idea going forward. I'm a believe in using options to limit risk, but I don't like buying puts to protect a portfolio. Michael prefers wise asset allocation. I don't believe there is a single strategy that works for every investor and it may be difficult, but you should be able to find one that works well for you. It was certainly interesting for me to read this post. Thanx for it. I like such themes and everything that is connected to them. I definitely want to read more on that blog soon.